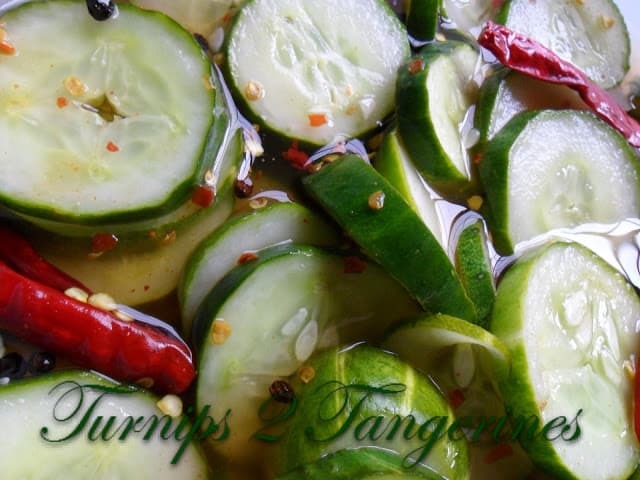 Spicy Refrigerator Pickles is one of our favorite pickle recipes. 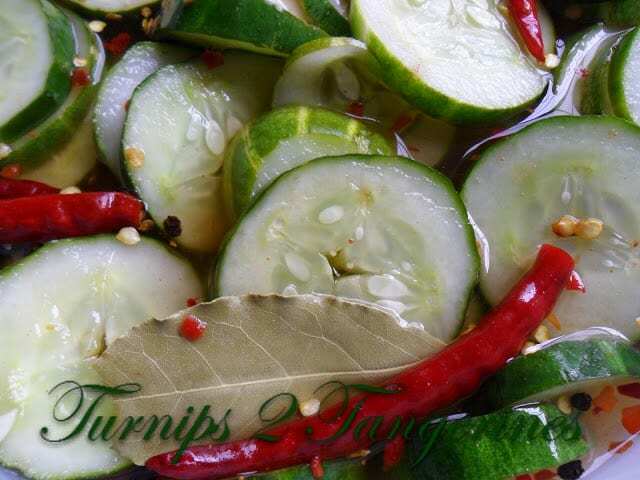 Or should I say one of my hubby’s favorite pickle recipes. They are easy to make and can be kept in the refrigerator. A few ingredients are a must to make these pickles just right. 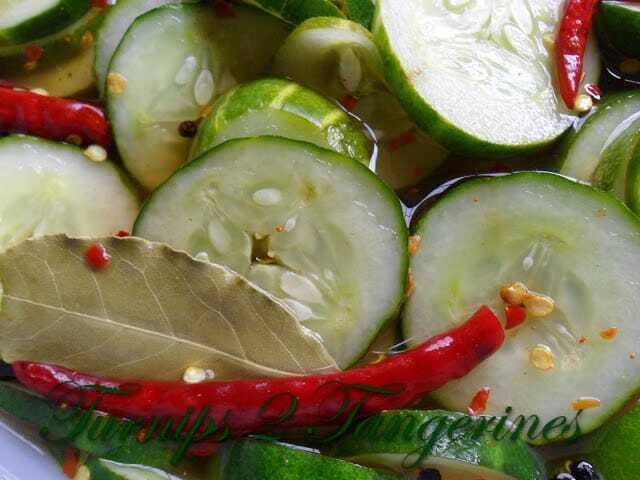 Garden fresh pickling cucumbers are always the best to use, dried chili peppers and hot sauce will give the pickles the right amount of zip. As with all pickles the longer they are allowed to sit, the better they will be. This is especially true for these refrigerator pickles. The longer they sit, the hotter they become but at the same time, they tend to mellow somewhat. With added cayenne pepper and red pepper flakes, along with the hot sauce and dried chili peppers, they are super hot. If your a fan of hot and spicy food, you’ll love these, if your not, beware! Place sliced cucumbers in a clean, large glass bowl. In a medium saucepan combine, sugar, vinegar, water, salt, hot pepper sauce, crushed red pepper flakes, whole peppercorns, bay leaves, dried chili peppers and cayenne pepper. Bring to a boil and boil 1 minute. Remove from heat and let stand 10 minutes. Pour mixture over cucumbers in glass bowl. Cover. Refrigerate at least 3 days before serving, stirring occasionally. Remove bay leaves and chili peppers before serving. Store in refrigerator. You can serve refrigerator pickles with any of these meals; Easy Pineapple Orange Ham Sandwiches or Brats n’ Beer. For more information about canning and the art of preserving, plus to find ‘pick your own’ fruits, vegetables and everything in between go to: Pick Your Own. 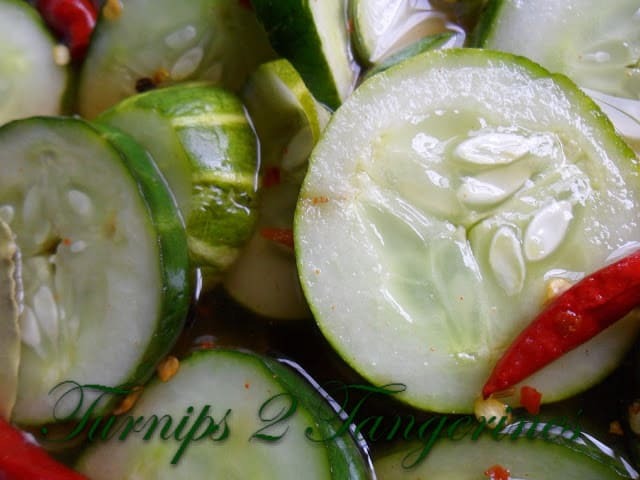 I love the recipe…cucumber pickle. Yum. I can almost get the taste of the tartness along with the sweetness of the jaggery and hot chilli to take it up another notch! I love refrigerator pickles. I'll have to try your spicy version for my husband. Thanks for sharing at The Creative Home & Garden Hop. Come on over and link up your latest creation! My husband would love these pickles. He loves everything with a little bit of spice. I guess that's why he married me. LOL! I've never made pickles, but I grew up eating homemade pickles. There is nothing better. Thanks for sharing this with our readers at the Get Fit Friday hop. Our readers are going to love this recipe. I look forward to reading more. Your Spicy Refrigerator Pickles look delicious. Thank you so much for sharing your awesome recipe with Full Plate Thursday. Hope you are having a great weekend and come back soon! 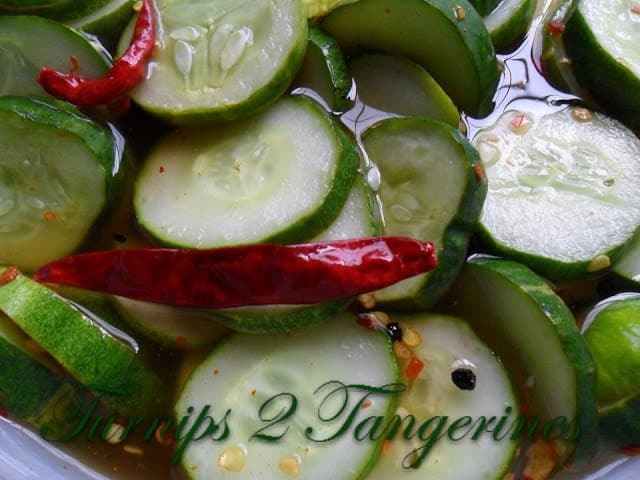 Hi Lynn, very refreshing cucumber pickles. It's definitely very appetizing, thanks for sharing your version. It's very similar to what I make but I skip chili peppers 🙂 They are delicious!